The Colosseum of Rome : another great page of easy to understand, bite-sized pieces of accurate information about how this icon fits into Italian history and culture. And, if your roots are in Italy, it will tell you a great deal about your Italian heritage. Based on our experience of visiting this amazing monument, not an encyclopaedia! Clicking on any of these links will take you directly to that section. The Colosseum of Rome in Italian culture now. If you've ever visited Italy you'll know how big graffiti is in Italian cities. It was in ancient Rome, too, and there's evidence from ancient Roman graffiti that Gladiators were like modern day pop stars or sportsmen with their own fan clubs and followers. 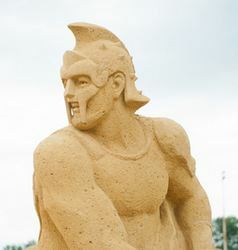 Statues of gladiators were common in Roman homes. Most began as slaves but were highly trained, medically cared for and fed on a healthy, high protein diet - so became an expensive commodity. Exactly like modern sports people, groups of ancient Roman Gladiators were owned by a trainer/manager who paid for their care. He received payment from the Games sponsor (usually an Emperor) when one of his Gladiators was killed - so staging fights could be a real drain on funds. It's estimated at its height the Games used one third of the Empire's income. 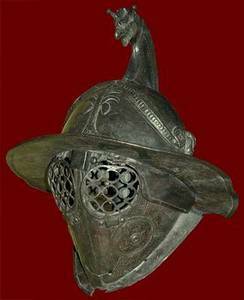 There were different types of Gladiator, named according to the weapon they fought with. The most popular were the 'Retiarius' who fought with a net, and the 'Thraex' who had a short sword. The belief that Gladiators began the Games by saying "We who are about to die salute you" is a myth. So is the belief that a 'thumbs' up sign meant a Gladiator should be spared and 'thumbs down' that he should be killed. Ancient evidence tell us that the sign for killing was waving the thumb in more or less any direction. For sparing a life the thumb was kept pressed against the hand. 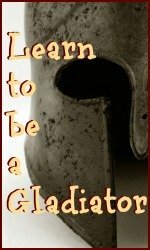 Top Tip : If you're planning to visit Italy, learn all about ancient Roman Gladiators at the Gladiator school of Rome. It's a fabulous, fun day out for all ages. Who else appeared in the Roman Colosseum? The Colosseum of Rome was also used to parade exotic animals to the public in exactly the same way modern circuses used to display wild animals (and in Italy, still do). 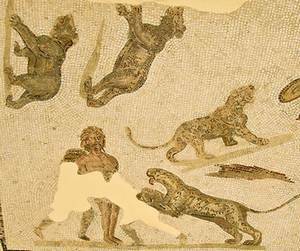 Ancient mosaic of an animal hunt in the Arena. The Games would generally open with a parade of animals and Gladiators who were billed to appear later, complete with a band. Before lunch would be animal fights. This included both animals pitted against each other and staging of live hunting scenes. These included stages set with trees and bushes; both domestic and wild animals were hunted and killed by one of the lower grades of Gladiator, the "Bestiarii'. There's evidence of every type of animal from wild boar to tigers to chimpanzees, donkeys to zebra to rhinos. Ostrich races were common and elephants were frequently paraded as well as being used as beasts of burden. Remember - no-one had previously seen animals like this. 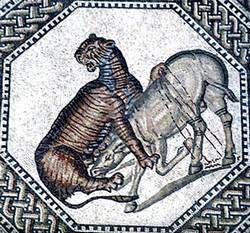 Mosaic of an animal fight. If you'd like more detail, here's a link to our page about ancient Roman animals and their treatment. 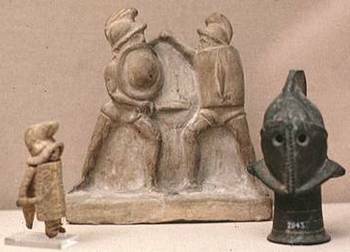 Over lunch time there would be the execution of criminals; afternoons were given over to the immensely popular sport of Gladiator fights. Only one Emperor - Comodus - ever appeared in the Colosseum of Rome as a fighter, but Emperors occasionally ordered men from amongst the nobility to fight for their own entertainment. Top Tip : Want to introduce your family to wild animals in a safer environment? Not many people know that Rome zoo exists, but it's a great day out for kids who've had enough of sightseeing! Does Italian history tell us how many were killed in the Colosseum of Rome? Despite popular belief, we know that martyrs were not killed here. That was a myth created by the Church in the 17th and 18th Centuries, when they promoted the Arena as a site of pilgrimage to prevent it being vandalised. It is right that people were used as human bait for wild animals but they were convicted criminals, prisoners of war or slaves. The Colosseum was the ancient Romans' form of capital punishment. Ancient mosaic of an animal killing. It's especially poignant that in modern times, the Colosseum is lit up every time a country abolishes the death penalty. 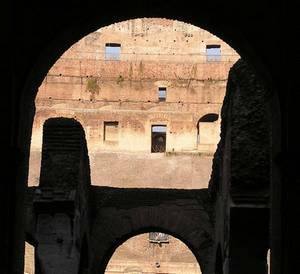 See our page of strange facts about the Colosseum for more details. We know from ancient writings that at the opening Games alone, over five thousand wild animals and two thousand humans were killed during the hundred day ceremony. You'll see lots of different figures about how many deaths happened in the Colosseum of Rome but the fact is that no-one is very sure exactly how many died there. What is known is that Emperors held the Games wanting to impress their subjects throughout the Empire, and that the more Gladiators who fought on any single day, the more impressive the Games were thought to be. Top Tip : Whether or not you are Roman Catholic, if you're in Rome at Easter the 'Stations of the Cross' which the Pope celebrates at the Colosseum are spectacular. 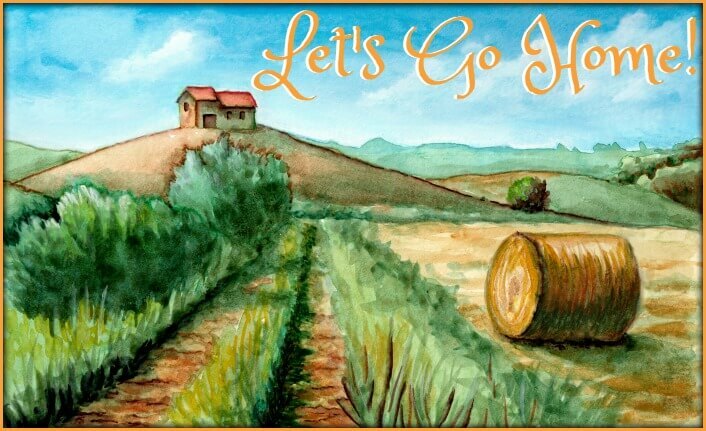 For more details see this page about Good Friday in Italy. When did it all end and what happened to the Roman Colosseum then? It's hard to conceive of such bloodshed being sanctioned by an Empire which gave us the foundation for modern civilisation. But for a long time Arena spectacles were the main entertainment for all but the lowest sections of society in the Roman Empire. the entrance arches to the Arena. The Colosseum of Rome was the largest, but you can find the remains of Colosseums all over what used to be the Roman Empire. It wasn't until the year 483 A.D. that Gladiator fights were banned. There are two schools of thought as to why it ended. Firstly, the increased impact of Christianity on the Roman Empire changed the values and principles not only of the masses but also of their rulers. However, it is at least as likely that fights ended because of cost. Gladiator games were expensive, and Emperors finding the Empire more and more under threat needed to spend their money on armies, not entertainment. 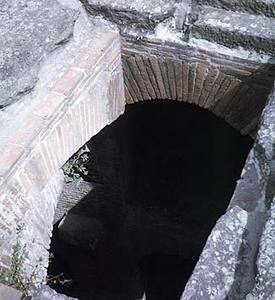 A trapdoor through which animals appeared in the Arena. The ridges supported the door. Animal hunts continued until the year 533 A.D. when the Emperor Teodoricus also banned these. Again, importing wild animals from Africa was a costly business. After that time the Colosseum of Rome fell into disuse and became increasingly derelict. In the 9th Century it was partially reclaimed and made into a fortress; by the 13th Century it had been taken over by the Church but was still uncared for. An earthquake in the 14th Century caused part of the building to collapse, after which time it was thought to be fair game for anyone looking for precious metals and stone to build their own palaces. Top Tip : The marble steps you see at the front of St Peter's Basilica are made from stone taken from the Colosseum's façade and seats. The place of the Roman Colosseum in Italian culture now. dedicating the site to martyrs. As the influence of the Church increased, so it played an increasingly important role in the development of the Colosseum of Rome as we know it today. This started with a rather strange attempt by Pope Sixtus V in the 16th Century to turn it into a woollen mill. The attempt was a failure. 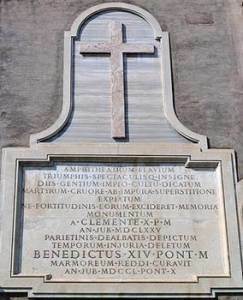 In the middle of the 18th Century, Pope Benedict XIV took it upon himself to consecrate the Arena in memory of Christian martyrs - despite the fact that there is no historical evidence of any Christian person ever having been martyred there. Given that it had now claimed the Colosseum for itself, the Church then decided to restore it. The restoration began in the 19th Century and saw some famous Italian architects working on it including Raffaele Stern and Giuseppe Valadier. The restorations were continued in the 20th Century by Mussolini, who envisaged the building as the great symbol of Rome it has become. The Church no longer plays a part in its development. Most recently, the underground passages used for Gladiators and animals to await their turn in the Arena have been opened to the public. Seeing this amazing restored area gives a very clear picture of what it must have been like for Gladiators to wait in the dark, restricted passageways with wild animals caged amongst them. Top Tip : The underground area makes fascinating viewing but in order to avoid vandalism and erosion, access is strictly limited to one tour a day. 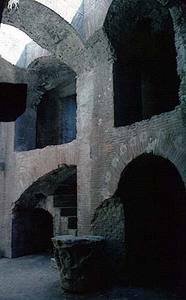 For more information about that tour, follow this link to our page about the Roman Colosseum and its secret passages. 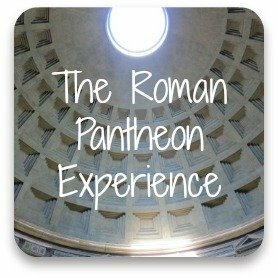 Want to know more about the Colosseum of Rome? Be careful which sites you look at - there's a lot of misleading and inaccurate information out there. The most historically accurate site is V-Roma which is created by historians and has an excellent selection of text and image-based information. All of it is historically checked and verified. Here's what our first page of historical facts about the Colosseum of Rome includes. Click on any of these links to go directly to that section. If you've enjoyed our facts about the Colosseum of Rome, you may also like these pages.